Two tasty little cherry-flavored gummies can give you your daily B12! 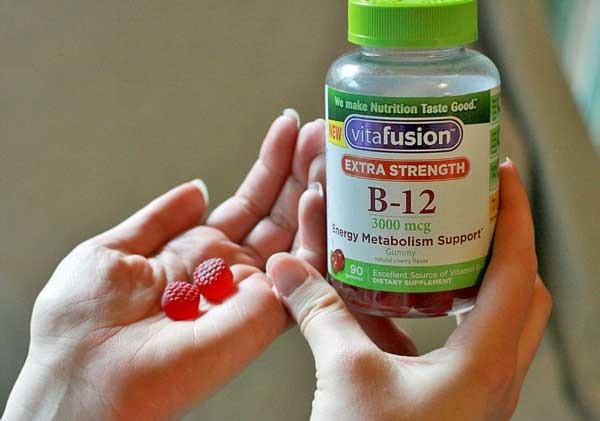 I'm on a quest right now to Get Healthy (I always think of it as a trademarkable phrase), so I was delighted when BlogHer and vitafusion™ gave me an amazing resource to try out toward that goal: vitafusion™ Extra Strength B-12. These gummy vitamins are a yummy, enjoyable boost to my daily nutrition. Since February (we're a little slow on the uptake for New Year's resolutions), Sam and I have forsworn grains and also most refined sugar. For those of you following along regularly, we gave up grains about two and a half years ago at about 80-90% compliance, but we decided to be absolutely strict about it for a while, and for kicks, also see if we could do without added sugars. It's a challenge, but a worthy one! That's why I'm always on the lookout for ways to ensure we're meeting our daily nutritional goals. I'm happy we're eating more whole foods and am confident that will help us meet our health needs, but I'm never sure what gaps there might be. For one thing, I don't eat the most varied diet. I like certain things and am not keen on others, so I tend to eat the same (delicious) meals over and over. Plus, I recently gave birth and am breastfeeding, so I know my nutritional needs are heightened. That's why supplements give me that extra boost of reassurance that I'm doing what I can to be complete. I am now, and would love some more delightful followers & followees! 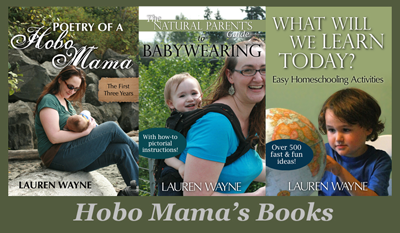 Follow me at hobomamacom & I'll follow you back! 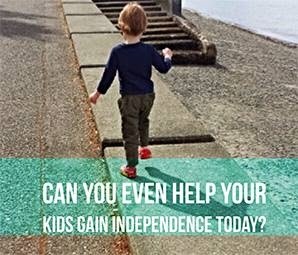 I'm happy and proud to have a post today on the BlogHer home page: "Can You Even Help Your Kids Gain Independence Today?" That's totally what I wanted to do with those quotes and didn't! Procrastination pays off! And looks so much prettier than I would have done! I'll be hanging out over yonder to field comments and spark some chatter on the topic of free-range kids. Come join me! Even if you've already read the post and let me know what you think, I'd love for your clicks on and shares of the BlogHer page so they know I'm sending my peeps over to give it a look! And if you haven't commented or shared it yet, I'd really appreciate your voice added to the conversation. 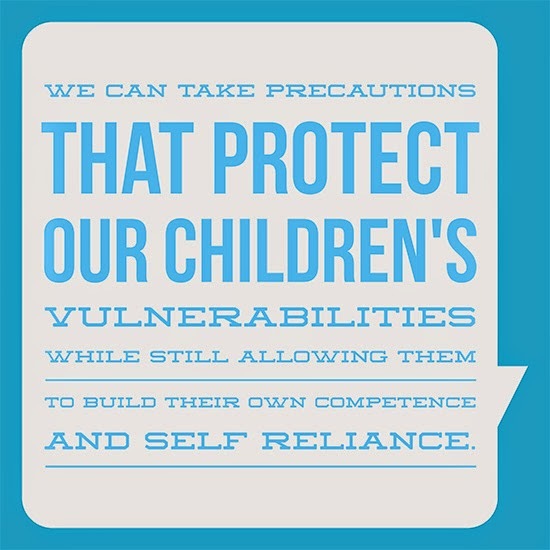 Why is it so hard to grant kids independence today? 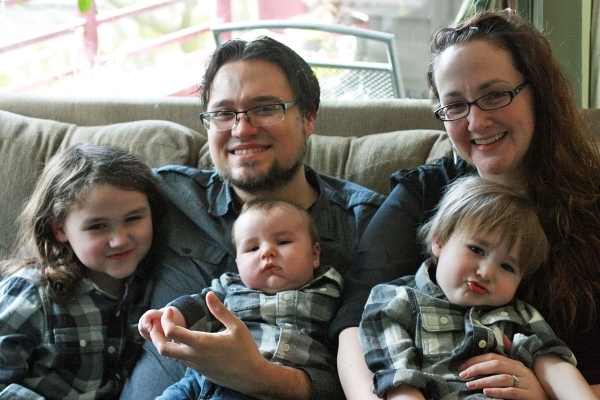 The other day, Sam, Alrik, and I wanted to head out to the playground — and Mikko didn't. Now, the playground is literally a block from our home. Mikko is 7 years old, nearly 8, and perfectly capable of amusing himself and retrieving drinks or snacks as needed in a short absence of parental supervision. But we knew we couldn't leave him home alone, and told him as much. "But whhhyyyy?" he asked. Indeed, kiddo, why? Because the neighbors might call the cops on us, that's why. Instead, we had to cajole and bribe him into accompanying us. In fact, Alrik, Karsten, and I left first, and Sam followed a good forty minutes later, with new plans and relevant toys to meet up at the beach for a digging party, the activity Mikko finally agreed to. My kids live 3,000 miles from one set of grandparents and 2,000 miles from the other. 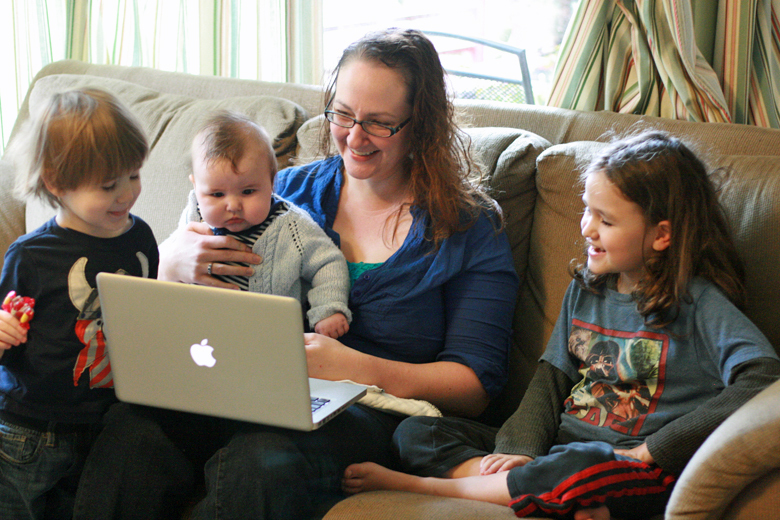 As you can imagine, visits are all too infrequent and phone calls with little kids (aged 7, 3, and 5 months) just don't cut it, but I really want to keep my kids connected to our extended families. That's why I jumped at the chance to review Panasonic's new HomeTeam™ app. 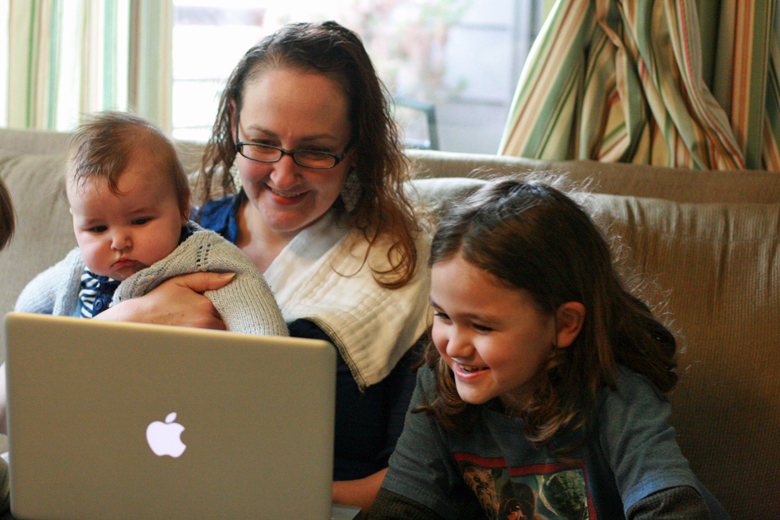 It's a video chat specifically geared toward the grands, both older and younger. You can read books, play games, and make family connections, no journey needed. HomeTeam is here to help us out, guys. It relieves all the "but what do I do?" anxiety around video chatting between grandparents and little kids. Because it's not just video chat — it's video chat and then some! You can read books together and play child-friendly games. You finally have something just perfect for building those bridges between the generations, giving them something to do together and lending a natural flow to the conversation. Kids will remember Grandpa next time he comes to visit as the guy who plays checkers and Nana as the person who reads them all those wonderful stories. 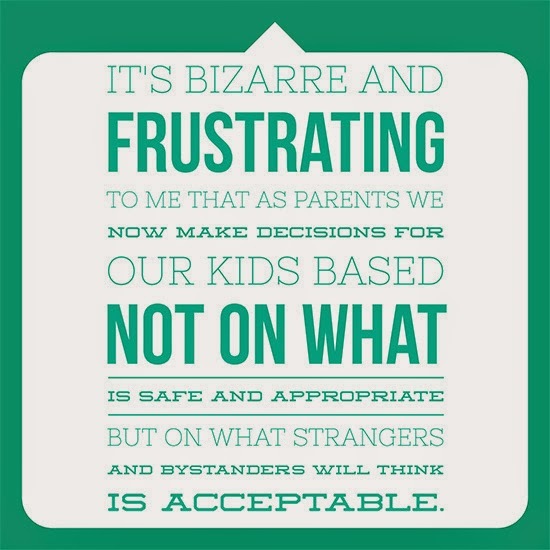 This post was written for inclusion in the monthly Carnival of Natural Parenting hosted by Code Name: Mama and Hobo Mama. This month our participants have shared stories, lore, and wisdom about family history. Please read to the end to find a list of links to the other carnival participants. Mikko is seven, nearly eight. He doesn't like to say he can't read yet — he says he's "in training." This is very true. Since Sam and I both learned to read, organically, from a pre-preschool age, we weren't prepared for a child who was heavily resistant to the idea of decoding written language. We don't want to push him to do anything he's not ready for, but we also have relatives and neighbors and other well-meaning folk asking us repeatedly, "Can he read yet? … How about now?" So Sam and I got an idea. We'd emphasize with Mikko how much fun reading is, and how practical as well. (He's a pragmatic soul.) We'd talk about reading as it comes up in video game screens (very important to him), we'd read aloud fun books together (Mikko and I are onto the second Harry Potter at the moment), and we'd ask for help from some of the very people expressing concern: his relations. I emailed Mikko's grandparents on both sides and his sole, delightful cousin. I requested, if they would be so kind, occasional emails, texts, and even written letters — maybe one thing electronic a week and one thing snail-mail a month. I had an idea that if a correspondence could be struck up and the ball pushed into rolling, Mikko would get caught up in the enjoyment of the back-and-forth. The other night, I had a a dream that I was pregnant again. Since I don't quite remember and didn't understand, I'll spare you the weird, dream-like details of how this happened (something involving an evil queen, I think? 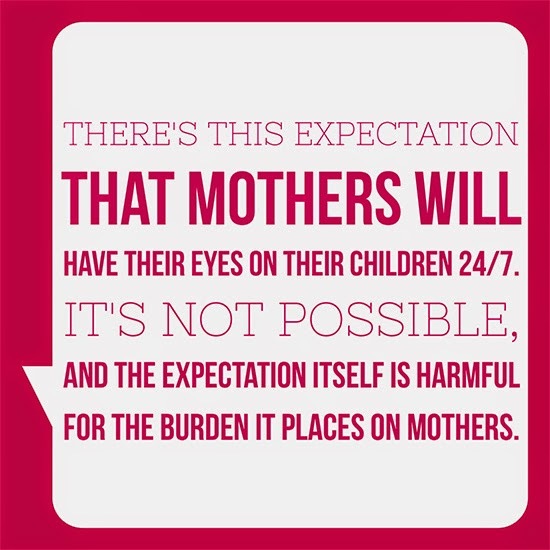 ), but whatever the cause, there I was, expecting another baby when my current one is just five months old. We would be having four children instead of the three we'd planned on. In my dream, Sam and I had a reaction of: "Oh. Well, ok, then." I wasn't unhappy. I would embrace this child as I had the others, but…. But I'd have a newborn when this baby was only fourteen months old. I was just about to get rid of my maternity clothes (well, the ones I'm not still wearing, ahem). We had accepted that Karsten would be our last, and now here we were being thrown back into the thick of it again. I tried to wrap my dream mind around the concept that we would be a family of six instead of five — it wasn't what I'd anticipated, and it was a hard thought to surround, like something stuck in my throat. When I woke up, I was relieved. Not at the fact that we weren't having a fourth baby, but at the fact that I was apparently more at peace with it than I'd thought. If my subconscious was telling me a fourth would be a less-than situation, then stopping now must in fact be the right decision for us. I thought something fun would be just to show off a few of the cute pictures of Karsten since the last time I posted a Wordless Wednesday when he was not yet two months old. He just turned five months and is a chunka-chunka burnin' love, but I've edited pictures only for the rest of two months through three months. Yup, photo editing is one of those things that's hard to fit in as well! 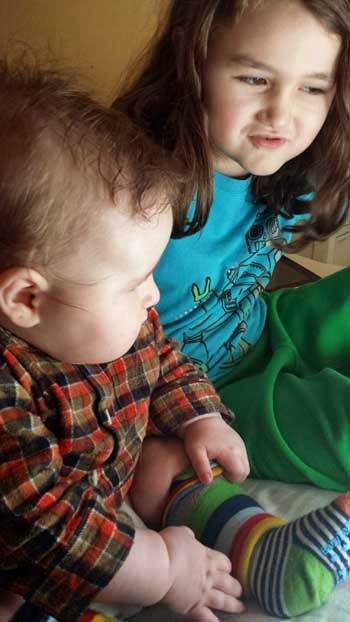 Anyway…here are some adorable pictures of all three kids from December and January!